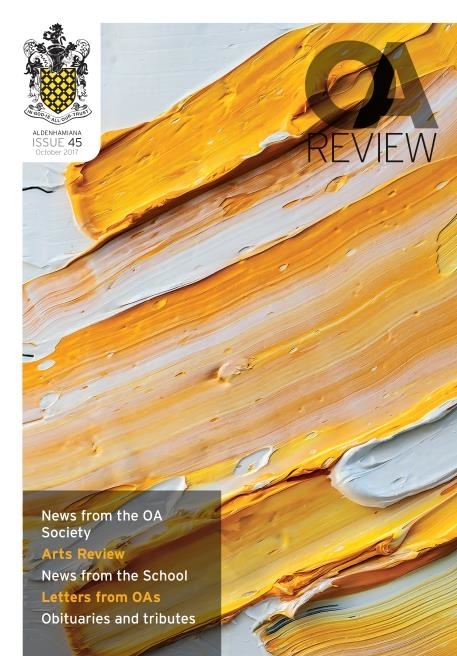 The latest issue of the OA Review is now available for members to download from the Publications section of this website. Congratulations to Lydia Chapman (P2010-12) as the new Editor of this publication, which includes news and views from OAs worldwide, along with reports about events and activities at Aldenham and beyond. Make a note of dates of forthcoming events, in particular the Annual OA Dinner on Saturday 25th November '17. Lydia is keen to involve as many OAs as possible and engage all ages through the magazine. In this edition she includes a fascinating insight into the lives of OAs who work in a variety of arts related fields. This section will be developed by the School as a careers document for current students and further input from OAs in the Arts would be welcome. Next year and new focus will prevail and once again OAs will be invited to contribute. Hard copies of this excellent magazine will be sent soon. Please ensure that your address details are up to date or let the Development & OA Office oas@aldenham.com know if you are happy with an electronic version Log in to download a copy of this magazine.